Advanced Machining Processes of Metallic Materials updates our knowledge on the metal cutting processes in relation to theory and industrial practice. In particular, many topics reflect recent developments, e.g. modern tool materials, computational machining, computer simulation of various process phenomena, chip control, monitoring of the cutting state, progressive and hybrid machining operations, and generation and modelling of surface integrity. This book addresses the present state and future development of machining technologies. 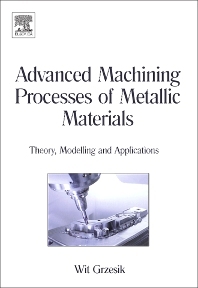 It provides a comprehensive description of metal cutting theory, experimental and modelling techniques along with basic machining processes and their effective use in a wide range of manufacturing applications. Topics covered include fundamental physical phenomena and methods for their evaluation, available technology of machining processes for specific classes of materials and surface integrity. The book also provides strategies for optimalization techniques and assessment of machinability. Moreover, it describes topics not currently covered in other sources, such as high performance and multitasking (complete) machining with a high potential for increasing productivity, and virtual and e-machining. The research covered here has contributed to a more generalized vision of machining technology, including not only traditional manufacturing tasks but also new potential (emerging) applications such as micro- and nanotechnology. This book is suitable for upper-level undergraduate, and postgraduate students, for researchers in the metal cutting area and engineers in the manufacturing, mechanical and industrial engineering sectors. Experienced engineers will find it valuable as a self-study guide.